Last night I met a teenage girl with big eyes, bittersweet chocolate skin and pursed lips. She greeted us and answered our questions sparingly. Then, as soon as we talked about Senegal and Africa, her eyes lit up and her mouth, as if ignited, started running a mile a minute. She spoke more in visuals than words, painting images of a devil chasing her through the streets of Freetown and a Malian medicine man throwing cowrie shells onto a flat woven platter to predict the outcome of her visa interview. Our neighbors had witches in their house. Things disappeared, business was bad, lots of negative energy. When the people came to chase the witches out of my neighbors' house, they asked that anyone with eye leave.She paused to take a quick breadth and noticed our confusion. Having eye is like, oh how do I explain it, you know, a connection...a connection with the other worlds. When they asked all who had eye to leave a few people left but they still felt that someone with eye was in the house. They walked around and people moved out of their way until they stopped right in front of me. You, they said, you have eye. They actually felt my energy and I had to leave before they chased the witches out. Others around the dinner table were wide-eyed, eyebrows askew - is she for real? I sat next to her listening intently, trying to see all that she invoked. I don't know her whole story, but it was clear that she was worlds away from the reality in which she had grown up. 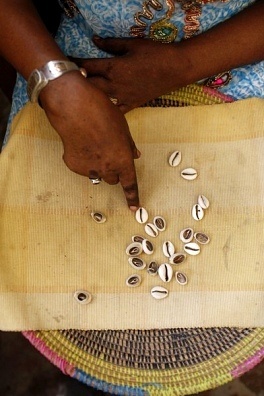 Fortune telling with cowrie shells ~ Senegal. She is very superstitious, said our host, I keep trying to tell her that just because lots of people are superstitious in Africa, doesn't make it all real. The host looked and gestured over at us for support. Actually, there are many phenomena around the world that can't be explained. I don't believe everything is real, but I certainly don't dismiss it all as pure superstition, I responded as the host's eyes widened. The girl, encouraged by our openness to her tales, continued. She wants to put on an African cultural performance at her school because her fellow African friends and classmates are embarrassed to speak their native languages. She glowed under our praises and continued to chatter about her plans for a fashion show showcasing traditional African styles. I know I talk a lot, but I've had this in my heart ever since I arrived here, she explained. As we parted ways, with plans to reconnect soon, I felt almost giddy, like I do each time I meet Alice Walker. It is so rare to meet someone in the U.S. who lives comfortably with magic and the otherworldly. Not vampires and wear wolves (which may exist, who knows), but centuries-old beliefs about energy and spirits that still play a part in daily life. Imagine all the ways this child must be pressured and ridiculed by both peers and adults to assimilate to our one-dimensional norm. If only her rich, magical stories were treasured globally the way European legends and even Eastern mysticism are valued. I only hope that her sense of self survives this place. I can't even count how many journals I have owned in my life. When you wear red-rimmed, perfectly round, gold-framed glasses at the age of seven because you read under the covers with a flash light after bedtime and offer poems as Christmas presents to family members, you inevitably receive a lot of journals. In spite of my wealth of notebooks and diaries and long history of journal writing, it's been a love/hate relationship over the years. Words written to oneself in a diary can be uncovered, read and exposed in the most horrific and traumatic of scenarios (second grade love notes exposed by Dad at the dinner table. True story.). And of course we have the power to contort the truth and deceive future readers (namely ourselves) in hyperbole, denial, or just pure fantasy. But the beauty of this intimate space makes up for all of its dangers. The holiday and new year season is my favorite time of year for self-reflection and journal writing. I love looking over past journal writings; it's like reaching a high place in a journey and being able to finally see the winding trail you've climbed. There is always going to be more hiking ahead, but I appreciate and praise the pause. Inevitably, the resolutions I set for the past year are a mixed bag of successes and utter failures. Some will be grandfathered into my resolutions for the new year. Some, the repeat failures, may be dropped altogether. 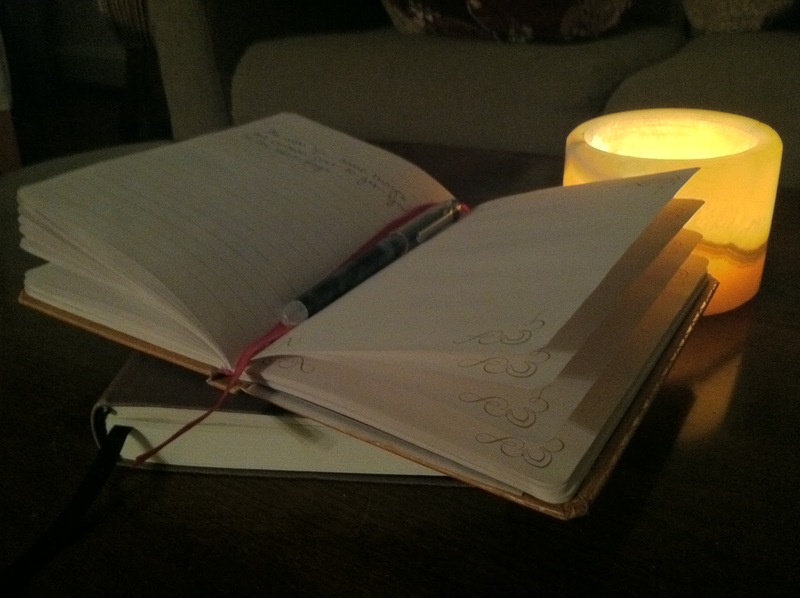 But no matter my state of stagnation or progress, I do still write down new year's resolutions in my journal. As with life, some things are written just to get you to the next page. Here, a gift from last year's journal pages. and letting it control you. This year I will not be controlled. I will be awake, vibrant, free. And if the Mayans were right, so let it be. Be well! Attend dance classes, run often and eat well. Spend and save consciously! Keep future needs and projects in mind. Write! Write anything, but remember what you know to be true is always the most powerful. Flex writing muscles and exercise imagination regularly. Disconnect! Enjoy a 'blackout' at least once a month reading, writing, eating, talking, playing by candlelight without the use of lights/power or electronics. The last resolution/intention occurred to me after one of several conversations with the hubby, who is from Senegal, about how dependent Americans are on electricity for everything. To those of you readers who were born and raised in the U.S., this may seem like a 'duh' statement, but it is not the norm in many parts of the world. In Senegal frequent black outs are the norm and you quickly adapt to darkness, candle light, and that medieval form of entertainment, conversation. Of course these moments are not to be romanticized; for the most part they are disruptive and harmful to the economic well being of people, businesses and countries. But there is something to be said about the social benefits of disconnecting from our various devices and reconnecting to each other, by candlelight. So this being one of the last moments of 2012, some reflection may be in order. What has this year meant to me and what significance do I want to create for the following one? This year has been one full of drastic transitions: settling into married life, finishing grad school, moving, and starting a new job. But the moments I will treasure most are those calm, introspective pauses, scattered like jewels throughout the year. I hope to create more of these moments for myself and inspire them for others more frequently in 2013. What are your intentions for the new year? Whatever they may be, I wish you peace, love, and many moments of pause in your undoubtedly busy lives. Happy New Year from WYHWTM! On Friday I had the privilege of attending Echoing Green’s 25th Anniversary All Fellows Conference. For those who aren't familiar with Echoing Green (EG), it is a NYC-based non-profit with a huge global impact. It provides a two year Echoing Green fellowship for early stage social entrepreneurs, which consists of financial support, services and access to a rich community of fellow entrepreneurs and supporters. In the last selection cycle EG received over 3,500 applications from 128 countries for the usual 30 spots within the fellowship cohort, making it more than selective with an acceptance rate of less than 1%. Last year was the launch of EG’s Black Male Achievement Fellowship in collaboration with the Open Society Foundation. Echoing Green is also, like its peer Ashoka, a pioneer of the growing field of social entrepreneurship and a thought leader in this movement. The conference was integrated with the annual All Fellows Conference, but was also open to alumni of the fellowship dating back to the early 1990's and former Echoing Green staff members (yay!) in honor of the 25th anniversary celebration. While it may seem odd to jump at the opportunity to use a day of vacation to attend an all-day conference hosted by an organization you worked for, for only a year, five years ago, I made sure that I was there. Simply put, this event was some much needed food for my soul. There was no red carpet, no staged photo area, no press, but the event, which also honored Ed Cohen, respected venture capitalist and the founder of Echoing Green, did attract stars, just of a very unique breed. Former EG Fellows present included Wendy Kopp, founder of Teach for America, Michael Brown & Allen Khazei, co-founders of City Year, Vanessa Kirsch, co-founder of Public Allies and founder of NewProfit, and Van Jones, co-founder of the Ella Baker Center for Human Rights and Green For All. These giants of social entrepreneurship not only founded some of the largest public service organizations in the nation, but they also contributed to introducing groundbreaking legislation like the National and Community Service Trust Act (AmeriCorps, 1993) and the Energy Independence and Security Act (Green Jobs Act, 2007). But it was not the mere presence of these famous social entrepreneurs that made the morning plenary sessions so moving. It was the familial intimacy displayed in a room of almost 300 participants. Cheryl Dorsey, EG president and another giant within the movement, spoke briefly on EG’s history and current trajectory. What struck me is how she punctuated her very informal, mic-less speech by pointing to folks within the audience, entrepreneurs from every stage of EG history, and integrated their personal and professional stories into that of the organization like an all-encompassing hug. Yes, the successes of Echoing Green Fellows and their respective ventures are amazing, but what was truly inspiring was the litany of personal thanks directed at Ed Cohen for his life-changing, compassionate confidence and investment in people. Not people in the abstract, ‘all of humanity’ sense, but in real individuals drowning in debt with only their ideas and passion to hold on to. “Ed Cohen has the highest degree of empathy for other people,” one alumnus stated. There were several direct ‘I love you’s,’ numerous forms of ‘you have changed my life’ and countless accounts of how Mr. Cohen and EG had stepped in as a lifeline in various personal and organizational crises. Then Ed Cohen spoke. Surprisingly zen, he noted that the phrase “perseverance further” was one of the most recurring in the I-Ching Chinese philosophy. He thanked others for the success of EG and went about sharing his meditations, illustrating his talk with stories, his own paintings and selected poetry. One of his major themes: collaboration. “The greatest power among social change people is in working together,” he insisted, after explaining how several EG Fellows collaborated with each other and other partners to be the first to invest equity capital in Native American reservations. The poetry, as he explained, was inevitable. Echoing Green itself was given the name of a William Blake poem. Ever the lover of this written form, Mr. Cohen pulled out a couple of well-used hardcovers and read the room of 300 change makers two poems: Try to Praise The Mutilated World by Adam Zagajewski and Ithaka by C.P. Cavafy. Saturated, we broke for lunch, which was filled with exclamations and hugs as people reconnected. The afternoon was divided into ‘Braintrust sessions’ in which guests, staff, and alumni provided ideas and recommendations to newer Fellows facing challenges. I realized more than ever how buzzed I get connecting people and helping them pursue their ideas and passions. I found myself adding to my own list of things to accomplish in life: I aspire not only to make the impact of a social entrepreneur someday, but to also have made the impact of being an ‘Ed Cohen’ to a network of change makers. An ambitious challenge indeed, but one I take on joyfully. On Wednesday, November 7th I had the pleasure of attending “Ntozake Shange on Stage & Screen” sponsored by Africana Studies at Barnard. The event began with a screening of Tyler Perry’s film adaptation of Shange’s choreopoem for colored girls who have considered suicide when the rainbow is enuf, followed by a panel discussion and audience Q & A with Ms. Shange, Soyica Diggs Colbert, Assistant Professor of English at Dartmouth College, and Monica Miller, Associate Professor of English at Barnard. With so much negative criticism surrounding Perry’s 13 million dollar film adaptation, the question burning on every one’s mind was, what does Shange think? I was relieved to learn that her thoughts aligned with the criticisms I’d been outlining in my head since I first saw the film over a year ago. Shange was frank: "Tyler Perry's greatest challenge with for colored girls was what he was about to tackle." In other words, Perry could not grasp the radical nature of the work, and it was clear, at least from an artistic standpoint, he had no idea what he was getting himself into. Read more at BCRW BLOG. Sydnie L. Mosley is a dancer, choreographer and teaching artist who loves to write. Read more of her musings on race, gender, dance and life on Love Stutter. Last Thursday, October 11th, the UN and the global community celebrated, for the first time, the International Day of the Girl. This was a much needed acknowledgment of the all too common suffering, inequality and abuse imposed on girls worldwide and a tribute to their collective strength and determination. Sadly, this first celebration was marked by the shooting two days prior of Malala Yousufzai, a courageous 14 year-old girl and activist for girl's education and women's rights under the Taliban regime. She remains in intensive care and in our collective thoughts and prayers. "I have bad news for you: You're not clairvoyant. Not even a little. You have no idea how the future will unfold. But it will unfold, slowly and quickly and slowly again, in ways that you cannot now begin to imagine. So stop trying to guess what's coming next. All the effort you put into figuring out what will happen, all the scenarios you play out in your mind - they're useless. And that's a good thing. Relax and let the future arrive on its own time and in its own way. Allow yourself to be astonished." - Robin Bernstein, Historian. If asked the same question, my advice would be simple: love yourself beyond limits, unconditionally. Looking back, I think that might have solved a few problems, eased a few passages, and assuaged many anxieties. I'm still working on it. Of course my girlhood and those of the CNN interviewees are certainly much different from that of Malala Yousafzai. However don't we all, as girls, women, human beings, need the same fundamental advice, care, support, and encouragement? What advice would you give your 15-year-old self? The first presidential debate was indeed disappointing. I think we have all been so blown away by President Obama's masterful orations in the past and we've shaken our heads smugly during so many Romney foot-in-mouth moments that we were expecting a complete massacre (a lion in the ring with a kitten) but what we got was a much more even-tempered debate. We were bored. And that is what is so disheartening. Because we are a nation of immediate gratification, constant entertainment, and sensationalized everything it seems that we have lost the ability to look beyond the showmanship and actually process real content. So according to the media and word on Main street, Romney won the debate. But clearly, if you take the time to read the fact-checks it is evident that in his quest to impress, entertain, wow and otherwise captivate America with his confidence and banter, Romney was very liberal in his representation of the truth. Today, back in VA for another round of canvassing, one of the other volunteers piped up during training to ask how we should respond to conversation about the debate. The trainer immediately launched into his rehearsed defense, "It was disappointing the President was clearly tired, but he stuck to the facts and Romney changed the platform he had been running on for the previous five months..." Another volunteer, an older gentleman seated in a corner, interrupted briskly: "Don't defend him! We don't need to defend the President. Romney is nothing but a salesman, a clever, sleazy salesman who would sell his own mother to win votes." We agreed that this would be the message in our post-debate talking points. In another conversation about the debate later this evening I expressed my frustration with the fact that Romney, based purely on style and bravado, has been said to have 'won' the debate. A friend of a friend at the restaurant table leaned in and stated frankly, "that's because 40% of America is retarded." Excuse the derogatory and politically incorrect use of this term - I cite verbatim But is it true? Are we, as a nation, dumb? Do we need to have political discourse processed and then regurgitated to us in bite-sized palettes by the media like vulnerable little wolf cubs to be digestible? What do you think? Is this primeval blood lust reminiscent of the age of gladiators? Is it subliminal media manipulation? Or is America just plain dumb? Do you think that Romney really won the debate? And what should and does 'winning' entail? There will be things that drive you crazy - I know this is not news but I can honestly bear witness to the fact that there will inevitably be things that your partner does that will annoy you and you him or her. If your 'list' of ideal qualities and deal-breakers includes things like 'organized and neat' or 'has the same idea of romance/communication/social activity as me' you might want to rethink how important these are. Admittedly my husband and I were really lucky to have recognized our love and compatibility rather quickly, so we skipped over a lot of the 'learning about the quirks' process until after we were engaged and then married. We've since discovered that we both have unique ways to annoy one another - he embraces disorderliness and seems to think I can predict the weather and I frustrate him by making plans and revealing them to him as an after-thought. Being married takes getting used to. But we love each other and we acknowledge this in words and actions every day. So be sure to discern the subtle distinction between simply having high standards and being picky and uncompromising. No one is perfect and you will be surprised how flexible love can make you! It's all part of the game - Remember that awesome Micheal Douglass movie, The Game, where he plays a wealthy but bored-to-death bachelor who signs up for a mysterious game with a company that then begins to terrorize him? The entire movie you ask yourself whether or not the whole thing is a giant con or really a game. Well I can't tell you how many times this year we have referred to that movie in order to put tense situations into a larger, life-size perspective. Believe me, dealing with U.S. immigration and living on literally $20 for a couple of weeks until the next student loan disbursement comes through is no fun. But having a perspective-shifting mechanism as an individual or a couple works wonders. Empathy and Evolution are key - One of the most important lessons my husband has taught me is the importance of empathy in any relationship. He constantly challenges me to think and feel and consider beyond boundaries I have set between myself and others, including him. I am learning how to be more considerate, selfless, and thoughtful. Mind you, I wasn't a horrible person to begin with, but I feel like I've evolved in this past year. My younger sister has already attested to this - to my chagrin. Even admitting this takes a level of humility and the realization that we all have room for growth along various dimensions. Allowing people to impact you positively in these areas is part of what relationships are about. It is a constant give and take. Ladybugs, lots of Ladybugs - If you know me, you know that one of my all-time favorite movies is Under the Tuscan Sun. Though it fits squarely under the dreaded 'chick flick' category it is actually full of profound insights about life and love and happiness...no gagging please. One of the stories told to the main character played by Diane Lane by a friend is that when said friend was young she used to search in the grass for ladybugs for hours in vain. Finally, frustrated and tired, she would just give up and nap. When she would wake up she would have ladybugs crawling on her. The message is simple: sometimes the best way to find what you are looking for is to just relax and be and let it come to you. Whether what you want is your partner, your next professional opportunity, or some standard of 'happiness.' While I know this to be true, I am still coaching my over-stimulated brain to sometimes slow its pace. I am still learning to appreciate the pauses, the in between times, the lazy moments without plans, and empty spaces. I find this an even greater and perhaps more important effort in a couple. Not only am I constantly thinking and wanting and planning for myself, but my stress level, anxieties and lengthy to-do lists are obviously impacted by the thoughts, actions, wants and needs of my husband. Relationships of any kind, especially a marriage, do hold the possibility of double the stress. Celebrating the present moment, however unfinished or incomplete, rather than the constant search for future fulfillment is so necessary. All in all, we've had an awesome first year. It went by in the blink of an eye, as if I had walked down the aisle a month ago. We are blessed and never fail to acknowledge this to ourselves and each other and try to live in a way as individuals and a couple that is deserving of this blessing. It helps that we have a loving community of family and friends to keep us in check. May the adventure continue! and not through the mass.